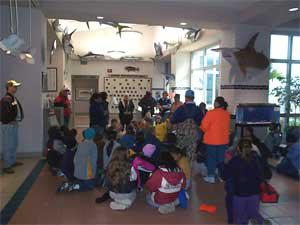 Sea Center Texas is a marine aquarium, fish hatchery and education center located on 75 acres in Lake Jackson, Texas. It is operated by the Texas Parks and Wildlife Department in partnership with the Coastal Conservation Association, The Dow Chemical Company and US Fish and Wildlife Service Sportfish Restoration Funds. The facility opened in 1996 and includes a visitor center with aquaria and exhibits of Texas marine life, the largest redfish hatchery in the world, 36 one-acre fish culture ponds, an outdoor wetland exhibit and a youth fishing pond. No food is available for sale at the facility. Picnic areas for large groups are located nearby at McLean Park. The facility is handicap accessible. Binoculars, a wheelchair, and walker are available for use on a first-come first-serve basis. Fiberglass replicas of state record saltwater fishes hover overhead in the lobby of the visitor Center. The 25 fiberglass mounts (most created by Bob Harris of Saltwater Taxidermy) include popular bay sport fish like flounder, black drum and red drum as well as offshore species such as blue marlin, tarpon and red snapper. And of course, there are several large sharks. The map displays the location of each of the exhibit areas listed below. 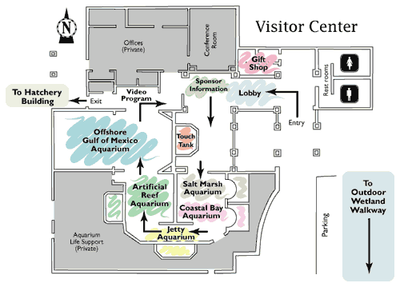 You may select a specific exhibit from the list or click on the map to use a larger interactive map of Sea Center Texas.